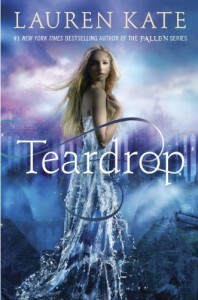 I wasn't the biggest fan of Lauren Kate's Fallen series, so I was very hesitant to pick up Teardrop. The promise of tears bringing about the end of the world and the presence of Atlantis ultimately convinced me to read this book, but unfortunately this somewhat intriguing premise was not enough to make Teardrop an enjoyable read. Teardrop hosts a wide variety of characters, many of whom possess rather unusual names... but unfortunately those names were the only interesting things about them. Eureka is one of the most annoying protagonists I've ever come across. She's incredibly self-centered and filled with more teenage angst than my entire graduating class combined. Yes, her mother did die and yes, that's definitely going to take a toll on someone's emotional state, but it was hard to feel any sympathy for Eureka when her internal monologue consisted mostly of her dislike for her therapists and her stepmother. These flaws could have been overlooked if Eureka had shown any character growth whatsoever but by the end of the book she was exactly the same - aside from her love for Ander since, you know, an attractive boy is all you need to find meaning in life. Speaking of Ander, I don't care if he's the hottest guy Eureka has ever seen (yes, she actually says that...), the guy's a complete creep. He admits to stalking/"observing" Eureka for her entire life, and yet by the end of the book she has gotten over her understandable wariness in his presence - to the point where she's holding back the words "I love you." Someone's got a bad case of insta-love, and it's super unhealthy. Overall, I was rather disappointed in Teardrop. It whispered promising things involving chaos at the hand of massive waves and ultimately didn't deliver upon that promise, instead choosing to show me a story filled with teenage angst and high school drama. I think it's safe to say that I likely won't read the rest of this series.